On pages 398-399 of the first edition of this book, Velva Diede Walden (my mother, although I'll call her Velva below) talks about some Diede relatives who went from Russia to Germany rather than to the United States. 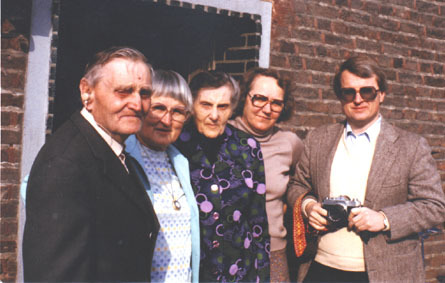 In April 1981, Velva and I visited some of these Diede relatives in Germany. Velva flew to Europe from her then home in Coos Bay, Oregon, and I flew to Europe from Boston where I lived. After visiting a close family friend near Copenhagen, Velva and I took at train to Dusseldorf, Germany. In Dusseldorf, we were met by Amalia Diede (page 396, line III.2, first edition), and I rented a car. With Amalia giving directions, the three of us drove to Herzogenrath, Germany, near Aachen (near where Germany, The Netherlands, and Belgium meet at the so-called ``three countries point''). In Herzogenrath, we met Karl Schorzmann and his wife Emilia Diede Schorzmann (page 395, line II, first edition) who lived with their son Willy Schorzmann and his wife Eve. Willy and Eve had a nice house, and I think Willy worked in (or had worked in) coal mines. I don't remember if Willy and Eve spoke English; I believe some of their children did. Karl and Emilia were in their 80s, I think, when we visited. Velva spoke the German dialect from Russia with Emilia; I think Karl was perhaps too deaf for Velva to talk to him much. Velva spoke regular German with Willy and Eve. We stayed overnight with the family. Tom Schauer (at that time stationed in the US military in Germany) met us there, and also stayed overnight. The family provided excellent hospitality. Amalia then directed us back to Dusseldorf where we visited Oscar Diede (page 396, line III.1, first edition) and his family. (I think Tom Schauer couldn't come along and went back to his military location.) I remember sketching on a piece of paper the relationship between me and Oscar and his son Marc (a scrap of paper I still have). In Dusseldorf we also met Amalia's daughter. Velva and I were planning to spend the night of the last day of our visit at an airport hotel, so I could catch a plane early the next morning to London where I was scheduled to conduct some business; and Velva was scheduled to catch a train to Switzerland the next morning. However, we got to the airport late and all the hotel rooms were taken (there was a convention going on). Furthermore, our car got a flat tire. Thus, Velva phoned Amalia and asked if we could stay overnight with her. She graciously agreed and said that she thought about inviting us but wasn't sure if we would want to stay with her. We took a taxi to her house, and I put in a call for a very early morning taxi back to the airport. That morning I caught my plane to London, and Velva caught her train to Switzerland. Velva and Amalia became quite friendly, and maybe even met again on a later trip my mother made to Europe. In any case, Amalia was the key contact person for our visit. Meeting these Diede relatives who took a different route out of Russia at a much later time than Velva's family left Russia was an unforgettable opportunity for me.